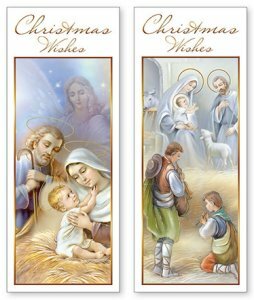 CATHOLIC GIFT SHOP LTD - Christmas Wishes Christmas Cards 2 Design. Christmas Wishes Christmas Cards 2 Design. 1 Christmas card Mary and baby Jesus or holy family. Christmas Blessings and Best Wishes for a Joyous and Peaceful New Year. Christmas cards are embossed with gold foiled and sold individually. Size: 7.5 cm x 19 cm, Individually wrapped with envelopes.